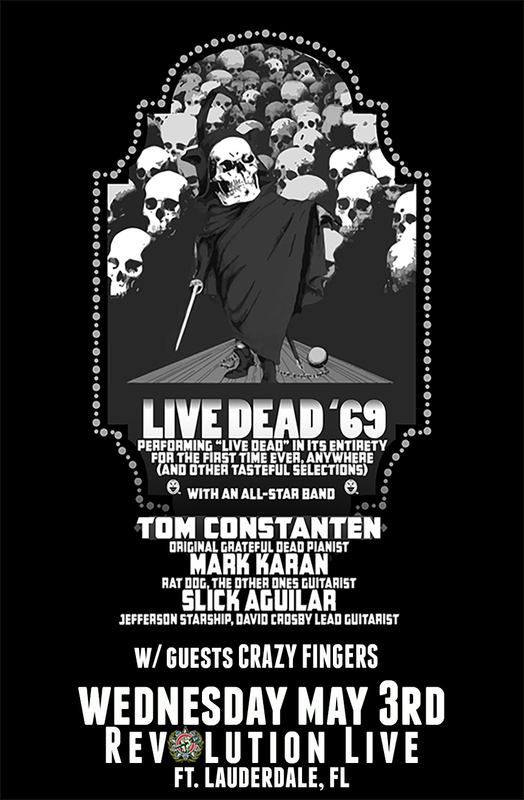 LIVE DEAD ‘69, Tim Constaten (Grateful Dead and original keyboardist on Live Dead album), Mark Karan (lead guitarist for Rat Dog and The Other Ones) and Slick Aguilar (lead guitarist for Jefferson Starship), performs the classic Live Dead (recorded in 1969) in its entirety for the first time anywhere ever, a laudable achievement unto itself. Moreover, they are the only touring entity that applies Grateful Deads classic zeitgeist of extemporization and interpretive improvisation beyond an ever expanding repertoire, much of which is created entirely in the moment without rehearsal or traditional preparation. The players edigree offers a unique familiarity with Grateful Dead’s halcyon material, and implies an improvisational prowess beyond anything else in the jam band genre.